Harmony allows you to use a library to store and reuse elements such as animation cycles, network effects and filters, trajectories, cut-out puppets, etc. We call these elements assets or templates. These libraries can be placed and used on different levels. Harmony provides some library folders, to which you can add your own libraries. Harmony’s library can be accessed from any scene opened on the machine. To store your assets somewhere other than the default location, you can create your own folder on your hard drive. If you are connected to a network, you can create a folder on the server to be shared with other network users. We recommend that you name your library with a relevant project name, such as adventure_library. The library folders and their templates are completely external to Harmony and can be archived and moved independently from the production. They can also be sent to other Harmony users. During the animation process, an animator will often reuse certain templates. 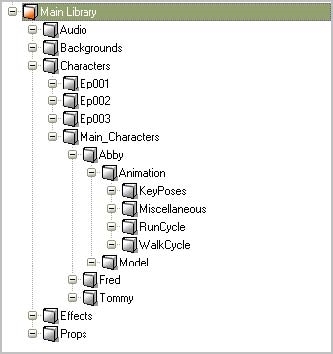 Some animators have their own personal libraries to store their favourite templates. If a template has been updated in the master library, the Library manager should send a note to the animators and the scene setup team to ensure that they update their personal libraries.